Out of print. This pattern was available for $4.95. This cheery baby blanket is packed with fun color that will catch baby’s eye. The raised flowers and joining seams provide texture for her little fingers to explore. Worked in hexagon motifs is pieced together to form a 3’ diameter hexagon that ends up almost round. It’s the perfect size and shape for taking along in the car seat or for extra warmth while you cuddle. The pattern is written in standard American terms in a printer-friendly format. Additional pages include pictures that show in detail how to execute the written instructions for the more complicated stitches. 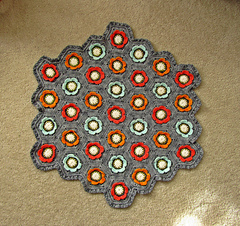 If you are looking to expand your crochet skills this pattern delivers! It features a faux ruffle and a unique raised joining technique that are easy enough for a confident newbie and fun enough to challenge long time crocheter. If you ever have questions about the pattern, I’m here on Ravelry and email to answer questions. 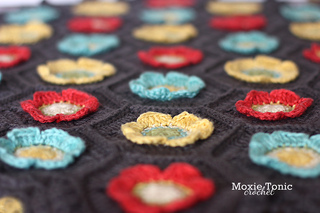 Or you can connect with me on Facebook - Moxie Tonic Crochet.